Canadian researchers are seeking the meteorite that caused this fireball over southwestern Ontario on March 18, 2014. Scientists are rushing to the site of a possible meteorite impact in Canada's southwestern Ontario after a bright fireball lit up the skies over that region Tuesday night (March 18). 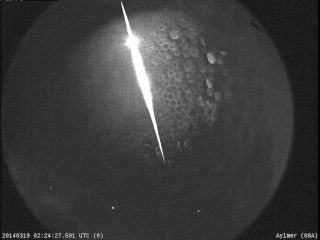 The basketball-sized fireball was spotted at 10:24 p.m. local time in seven all-sky cameras operated by Western University's Southern Ontario Meteor Network, according to meteor scientist Peter Brown of Canada's Western University in London, Ont. Two other camera systems in Ohio and Pennsylvania operated jointly with NASA's Meteoroid Environment Office also spotted the fireball, he added. This video of the March 18 fireball shows all nine camera views of the meteor flare-up. "In this fall, meteorites may be found in a small hole produced by their dropping into soil," university officials advised. "Meteorites are not dangerous, but any recovered meteorites should be placed in a clean plastic bag or container and be handled as little as possible to preserve their scientific information." Brown and Western University meteorite curator Phil McCausland are expected to hold a press briefing at St. Thomas Municipal Airport to discuss the upcoming meteorite hunt. They will be joined by meteor expert Bill Cooke, who leads NASA's Meteoroid Environment Office at the Marshall Space Flight Center in Huntsville, Ala., Western University officials said. "Meteorites may best be recognized by their dark and scalloped exterior, and are usually denser than normal rock and will often attract a fridge magnet due to their metal content," officials at Western wrote in a statement today (March 20). The university is based in London, Ont., Canada. Potential meteorite hunters should ask for permission of land owners before searching on private land, university officials warned. Editor's note: If you captured a great photo of Tuesday's fireball over Canada, or any other night sky view, and would like to share it with Space.com for a story or gallery please send comments and images to managing editor Tariq Malik at: spacephotos@space.com. Western University requests that any possible meteorite finds from Tuesday's should be reported to McCausland at 519-661-2111, ext. 88008 or on his cell at 519-694-3323. The university is posting updates about the meteorite hunt on Twitter @mediawesternu and with the hashtag #stthomasmeteor.